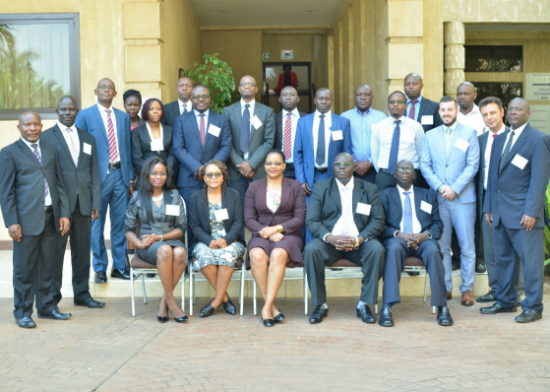 In partnership with the Ugandan Financial Intelligence Authority, the Global Center hosted a four-day training course on improving anti-money laundering and countering the financing of terrorism (AML/CFT) measures for supervisory authorities in Uganda. The training, supported by the Government of the Netherlands, focused on the role of banking, capital markets, and insurance sector regulators in implementing AML/CFT measures and their new responsibilities in that regard. The training seminar brought together over 25 participants from the FIA, Bank of Uganda, Insurance Regulatory Authority, and the Capital Markets Authority, and as a special guest included a senior officer from the Financial Intelligence Authority of Malawi. The meeting was co-facilitated by two expert consultants, Mr. Giuseppe Lombardo, an international strategic adviser on financial integrity who has supported the national risk assessment process for many countries in the region and Mr. Jackson Madzima, former director of the Financial Intelligence Agency of Bostwana. They led an inter-active training workshop, which helped the participants expand their knowledge on AML/CFT supervision, learn through peer presentations on current supervision procedures in Uganda, and develop better guidance on onsite and offsite inspections. For additional information about the workshop or this project, please contact Mr. Patrick Tobin at ptobin@globalcenter.org.